Michael Krüger, poet, novelist, translator and editor, was born in Saxony in 1943, grew up in Berlin and has lived – for more than forty years now – in Munich. 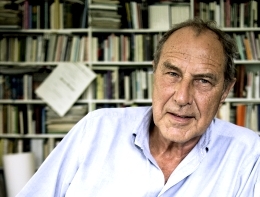 Although a prose-writer, essayist and critic of note, and also the editor of the important literary magazine Akzente, he is best known for some twenty collections of poetry, most recently Einmal einfach (2018) which brings to a close a sequence of five poetry volumes begun in 2003 with Kurz vor dem Gewitter. He is the recipient of many major prizes including the Joseph-Breitbach-Preis (2010). A Selected Poems, translated by Richard Dove, appeared in English with Carcanet in 1993 to mark Krüger’s fiftieth birthday. Sheep Meadow’s Last Day of the Year: Selected Poems, translated by Richard Dove and Karen Leeder, brings his lyric work up to date.